Demo & Stock Units - Shakerley Firetruck Sales / VRS Sales Ltd. Contact us for more details and pricing! Spartan MFD Cab with 10" Raised roof, seating for 6, 450hp Cummins Engine, 1500 GPM Q-MAx-XS Pump, 1000 Gallon UPF Tank, Bolted Stainless Steel Body with drivers full depth compartments, through the rear ladder and suction storage. Spartan MFD Cab with 10" Raised roof, seating for 6, 380hp Cummins Engine, 1500 GPM Q-Max Pump, 1000 Gallon UPF Tank, Welded Stainless Steel Body with full height compartments, through the rear ladder and suction storage. Spartan MetroX chassis seating for 6, 2000 GPM Hale Q-Max Pump, 1000 Gallon Tank, Welded Stainless Steel Body, Pull Out Pump Panel, Full Height Full Depth Compartments. This unit will be equipped with a Spartan MetroStar MFD cab, 450 HP Cummins Engine, 75' Aerial with a 500# tip load, "H" style jacks, Ladder Pipe, Hale 2000 GPM Pump, 500 gallon UPF tank, 10KW generator, and a Toyne Stainless Steel body. Click on links below for spec's and drawing. 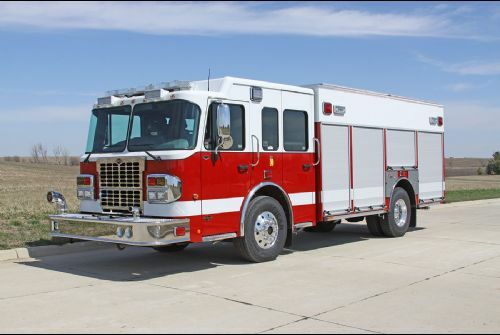 This unit is equipped with a Spartan MetroStar MFD cab, 450 HP Cummins Engine, Hale Q-Max 1750 GPM pump, 1000 gallon UPF tank, and a Toyne Stainless Steel body. This unit will be the North East Demo in the Spring/Summer of 2019. Click on links below for spec's and drawing. This unit will be equipped with an IHC MV607 chassis, 330 HP Cummins Engine, Hale 1250 GPM pump, 1250 gallon UPF tank and a Toyne Stainless Steel Body. Click on links below for spec's and drawing. Contact us for more details, pricing, and availablity! The perfect fit for those older fire stations with an overall length of 29'2" and at 10' overall height; this unit will be equipped with a MetroStar MFD cab, 450 HP Cummins Engine, Hale Q-Max-XS 1500 GPM pump, 750 gallon UPF tank, and a Toyne Stainless Steel body. Click on links below for spec's and drawing. This unit will be equipped with an Freightliner M2-106 chassis, 350 HP Cummins Engine, Hale 1250 GPM pump, 1250 gallon UPF tank and a Toyne Stainless Steel Body. Click on links below for spec's and drawing.